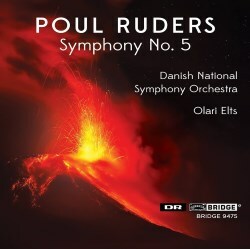 The Danish composer Poul Ruders has been drawing increasing international attention. I was mightily impressed by his Solar Trilogy, with its three sections titled Gong, Zenith and Corona (DaCapo 8.224054) and by some of his shorter works. His opera The Handmaid’s Tale has been widely performed, including by English National Opera, and has been recorded (review). I have not cared so much for his symphonies, of which I have heard the first three – so far I have missed the fourth but I was glad to catch up with him again with this his Fifth Symphony. His idiom may be described as what is now mainstream modernism, basically tonal but allowing himself a certain amount of dissonance. He is very adventurous in his orchestration with considerable use of percussion. The Fifth Symphony is in three movements. In the first, a jagged theme on the brass is constantly trying to win through. It faces opposition of various kinds, including high woodwinds, rumbling percussion and the strings which have a different idea altogether. The second movement is mainly slow and quiet, with a faster interlude. Music does not normally evoke visual images in me but I got a definite feeling of a starry night seen in the countryside where light pollution is low and it is very cold. It is somewhat like one of Bartόk’s night-music pieces transferred to a more Northern latitude. The last movement is somewhat like the first but with a driving rhythm which propels it forward. The brass manage to make it through at the end but only just. The themes are memorable, the argument easy to follow and the whole work is most impressive – the most impressive Ruders symphony I have heard. I have already played it several times and shall explore the composer further, perhaps going on to the Nightshade Trilogy which was recently reviewed. The Danish National Symphony Orchestra play with confidence. I imagine they have had several opportunities to play the work in public before recording it and their playing has none of that bright blankness which can afflict performances of new and unfamiliar music. The Estonian conductor Olari Elts is clearly committed to the work and has a secure grasp of it. The recording present a good concert hall acoustic. The notes are helpful though in English only. This disc is the tenth in Bridge’s series of Ruders recordings. This fact is mentioned in small letters on the back cover and details of most of the predecessors are in the booklet; the spine of the jewel case, rightly, says “Ruders Symphony No 5”. Bridge's continuing commitment to the composer is much to be praised, as is that of the other sponsors mentioned in the booklet. However, I should mention that although this is a full price disc it contains less than half an hour of music.